I'm enjoying the dining room gun rack, personally. Too many fussy details but the gun saves it. The kitchen to the right looks like a kitchen from Lassie. Where Lassie? The barn's on fire? Show me the way! I love the chairs and even the pink walls somehow. I like bubble gum and painfully neon hot pinks. Manly pinks that hurt your eyes! The curtains match that chair, dayum! I secretly hope that chicken photo changes out with whatever's for dinner. For steak night that better be a photo of a cow! See, painted brick walls are not blasphemy. People from 1959 can do it, and so can you! I want to live in this den, even though the shutters matching the couches freaks me out. Starting to realize I don't like TOO much symmetry. Woah, tacky! This goes beyond acceptable kitsch, this is gross. Is that a birdhouse on a train bed with a rail road crossing sign next to it? Musical instruments precariously balanced on a bed board above your little girl's HEAD?! No! Don't do it! Kind of enjoying that kitchen From the Future on the right but the scene on the left has its merits. Not my kind of space so I'll just say nice color? Nicely laid out? Nice chicken coop for the plates you got there. I love the couches and side chairs here. Looking so comfortable and beautiful. Can I dive into the pillows and help myself to whatever's in that decanter? And the fruit too, please. I want the shoji screen and what I see of the painting in the left photo. Do I spy some pre-photoshop photo manipulation? The fruits look cut and pasted into that photo! I love all the pops of red and teal in the space on the left. Just noticed both are always the same space but flipped for gender. I always wanted one of those nook-beds as a kid, they look so cozy. Perfect for making blanket forts, too. 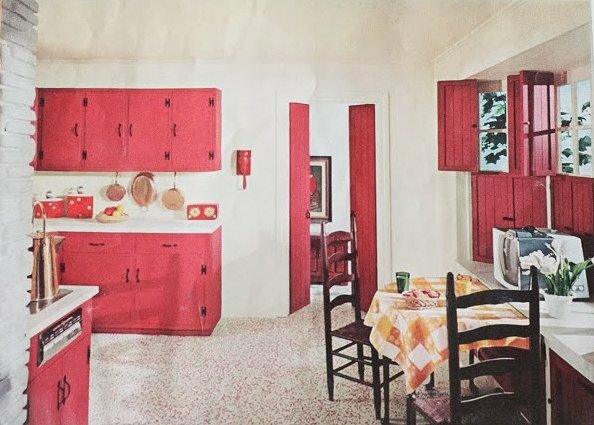 Closing out with some favorites, as much as I complained about matchy-matchy I enjoy the shutters, doors, and cabinets painted in bubble gum-hot pink. I think because here the rest of the space is bright, white, and minimal, it's just better design than in some of the other photos. Would move into this kitchen in a heartbeat. Not a favorite design wise but just...so many questions. Why fencing swords in this pink kitchen? Why the tiny grill thing in that aclove? With the little bench so you can sit, grill, and enjoy? While puffing on a pipe? It brings the indoors outdoors? Where do you live where you can't grill outside? Explain room, explain! 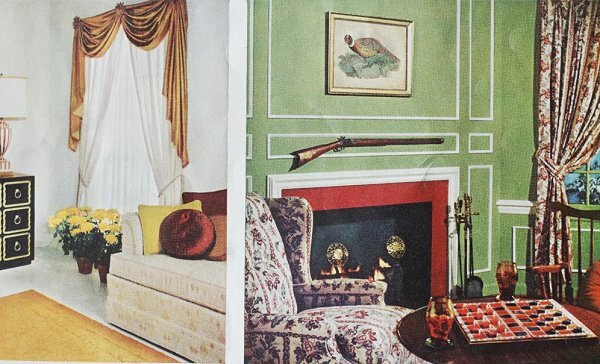 And I cannot resist a manly gun room with matching couch-curtains and sage green walls. Love that spcae to the right. It reminds me of a Resident Evil video game mansion room. Can I take the shotgun to shoot zombies? If I take it will I trigger a boobie trap? Is there a trap door not shown behind a bookshelf that will lead me to Bruce Wayne's Bat Cave?! I want that room! Which room is your favorite? 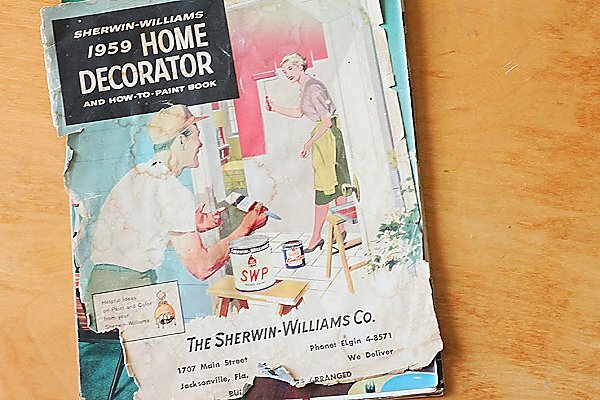 Do you love looking through vintage ads and documents, too? These are awesome, love it! Me too, so many more vintage things to scan! Thanks for the tour! 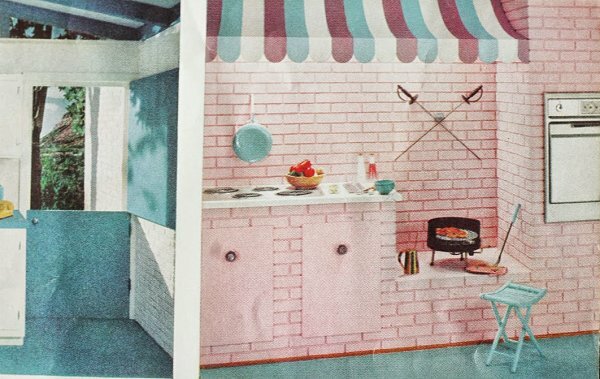 Like the pink & white kitchen w/ the wicker/iron stools-- it even has a pink floor! Decor really has changed! Nowadays there's so much clutter, collections, etc. Think I'm guilty of that too-- it's all those relatives who had pink kitchens giving me stuff! Damn, Van! I usually check your posts as they happen, but I've been lagging the past week or so. Just saw the pumpkin owl and was like "must have". The only holiday decorations I have are for Christmas. Would have loved to add that little guy to my home! Ah well, should have known he'd go quick! Sorry 'bout that, will keep an eye out for vintage Halloween goodness when I get back to the hunt. :D I need more of it myself. Hopefully I'll make some time for some Halloween crafts today. I miss doing that! 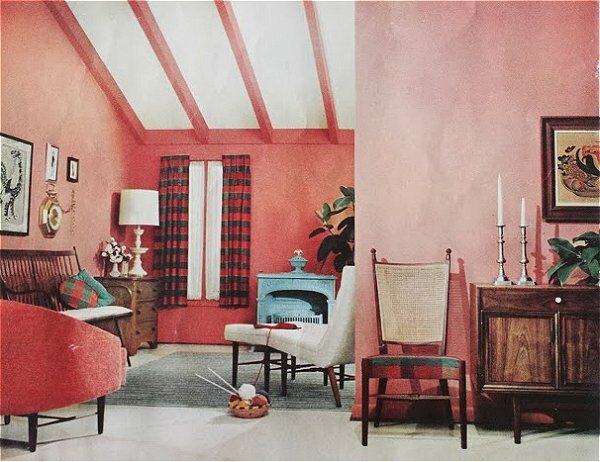 I love old decorating magazines, I used to be an interior designer and I have actually went into homes that looked like that. Sometimes old people, who decorated their house that way 50 years ago, they still think it looks awesome and stylish. Perhaps because it carries so many good memories or perhaps, its like people who have not changed their hairstyle in 30 years and still wear frosty blue eye shadow, they just get in a rut and they cannot get out of their safety zone. 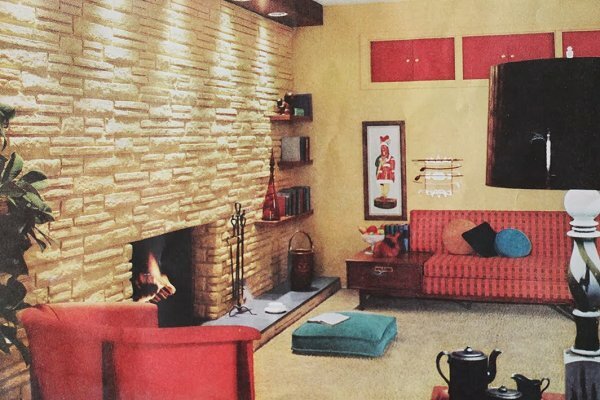 And the crazy part is that no matter how awful these homes were, there was always about 25% of their home décor items that were so awesome, cool, retro, that I would die to get my hands on! Ah ha, that explains your uncanny eye for good finds! I must see some of these authentic old home and ladies with time capsule style, I love it when people stay true to what they like. Just realized my house needs more guns, swords, and pipe racks. It has been judged and found lacking! Nuthin says redneck like ye old shotgun over the fireplace lol :) The train bedroom is a bit much but in the late 1980s early 1990s they went far worse than that! Remember those huge wall murals! Oh I recall looking at 80s-90s interior design books as a child and though a lot of it was horrid even then. Remember those fabric balloon things in many a children's room? Always though those were weird. child's* that is. Ur, time to turn off the computer now with these bad typos. I guess I'm weird in liking painted bricks! 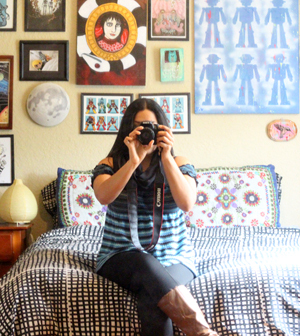 I think those look awesome in that room! And that indoor grill thing is the most wonderfully weird thing I've ever seen! 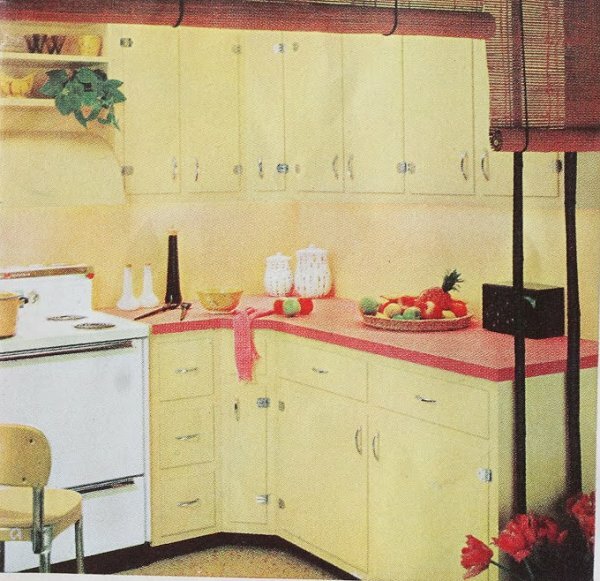 I also want to paint everything in my kitchen hot pink now... thanks, Van. Bwahaha, do it, I dare you! I don't mind painted bricks at all, either. My sons would love this house. They inherited antique rifles, shotguns, bayonets, and swords from my father and display them around our house. My 18-year-old has a whole wall in his bedroom dedicated to weapons; I hung on sign on his door that says "The Armory." That is AWESOME. :D ! I am in love the with turquoise sofa (5 from the bottom). I am in search of one with the same shape and details for home. Lol. That's an old-style train whistle on the train, not a birdhouse. But that comment made my morning...too funny. Also, and I know it's totally tacky and frowned upon, but I love the old style of decorating where you match the upholstery to the drapes. I find it charming, like when ladies used to wear the same pattern on their shoes and handbag. I do hate that most houses were decorated with a weird mix of mcm and classic Americana styles, like they couldn't decide what they liked so they just went with all of it. Thank you for the clarification, haha. The bird house would have driven me crazy. Train is not gross now ;D It's funny how it was standard and even expected to be so matchy-matchy at the time and now it can be kind of tacky. I don't mind it but I die if there's not some unique detail somewhere in a space. I'm way too pedantically nerdy about spaces, clearly. I love those old guides and catalogs too. Helps me date things. I recently got a bunch of old lampshades and now I can tell you these are 50s, those are circa '65, etc. 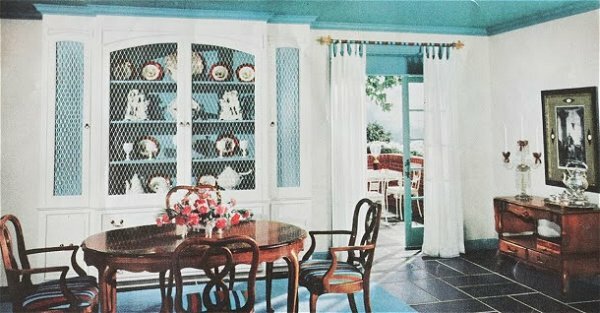 And you would be surprised (or maybe not) about how many people think furniture like that Victoriana in those photos really is antique when the truth is it was brand new in 1955. We get stuff like that in and people actually get into arguments with me about it -- no, it can't be 50s they say, it's 1900s and reupholstered. Gah! I'm starting to recall seeing something similar in old "Perils of Pauline" parody skits now and classic cartoons! It's all coming back to me. I don't trust anything I see as authentic 1900s when there are soooo many reproductions floating around, ESPECIALLY if it's in great shape. I may have passed over authentic antiques this way but I bet that's unlikely. Haha! Excellent, thank you for the tips! I wonder if it's painted stacked stone or if the wall was painted to match the stone? They match pretty exactly in the photo. Thanks for helping with the distinction! I must admit, I'm not really feeling it for any of those rooms. I think it's all the wacky colors that's throwing me off. I just want to go "No, no, no!" I think some of the funkiness of this type of design looks better in black and white - lol! I love mid century architecture, just not in this way. 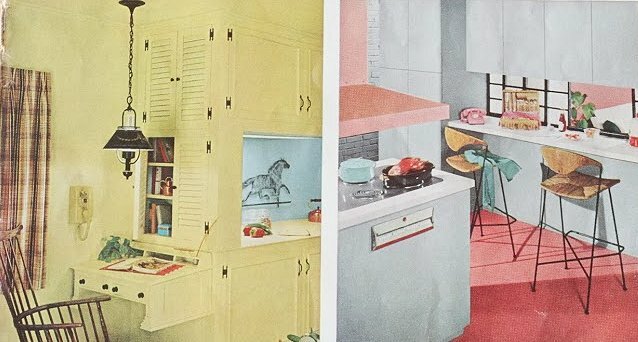 I recently acquired a lot of old Sunset magazines that were filled with mid century styles I love, which is the more open, airy style of space. Yeah, I enjoy the rooms more for their kitsch value and prefer later styles. It's probably because the spaces are from 1959 and still have a lot of fussy details from the 50s bleeding over. Fun to look at and see the evolution, though. Need to scan through some old Sunset Magazines. In this Sherwin-Williams catalog i liked the 9th picture. In that picture color combination is great and it is also looking stylish.